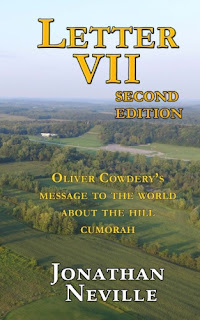 From time to time I still hear objections to Letter VII based on the idea that Oliver wrote them by himself and Joseph didn't endorse them. These objections are from Mesoamerican advocates, of course. Here's how the conversation typically goes. Me - "Oliver said Joseph helped him write the letters." Meso - "Oliver did say that, but we don't know how much Joseph assisted." Me - "Joseph had his scribes copy the letters into his own history." Meso - "Yes, but he wrote another history later, in 1838. If he approved of Oliver's letters, he could have just used those." Me - "First, Joseph did rely on those letters. Second, he didn't need to repeat the detail Oliver had written, such as when Joseph said Moroni quoted other scriptures he couldn't relate at that time. Third, Joseph's history covered topics in addition to what Oliver covered." Meso - "But still, Joseph never expressly endorsed Oliver's letters." Me - "He expressly gave Benjamin Winchester permission to reprint them in the Gospel Reflector." Today I'm posting an additional detail from my book, The Editors: Joseph, William, and Don Carlos Smith, which will be released (finally) this week. I've never seen anyone write about this before and I think it's significant. "We should be pleased to publish our paper weekly, as we have an abundance of matter for the instruction of the saints, as President Joseph Smith jr. is furnishing us with essays on the glorious subject of the priesthood, also giving us extracts of the new translation to lay before our readers, of the second volume,-but our circumstances will not permit us to publish oftener than twice a month." In the next issue, Don Carlos began the Times and Seasons with "Extract from the Prophecy of Enoch." That fulfills the promise of "extracts of the new translation." But what about "essays on the glorious subject of the priesthood" that were promised? Don Carlos does publish an essay "on the restoration of the Priesthood," presumably also "furnished" by President Joseph Smith, Jr. But what is this essay? It is Letter I of Oliver's series of letters. When you go to that page, search for "Priesthood" and you'll see the term appears only in Oliver's letter. Don Carlos proceeded to publish all of Oliver's letters in the following months, including Letter VII. In fact, the next issue of the Times and Seasons, November 15, 1840, starts off with Letter II. And again, this letter contains the only mention of the Priesthood in an article in that issue. So here again, we have direct evidence that Joseph Smith formally and fully endorsed Oliver's letters.